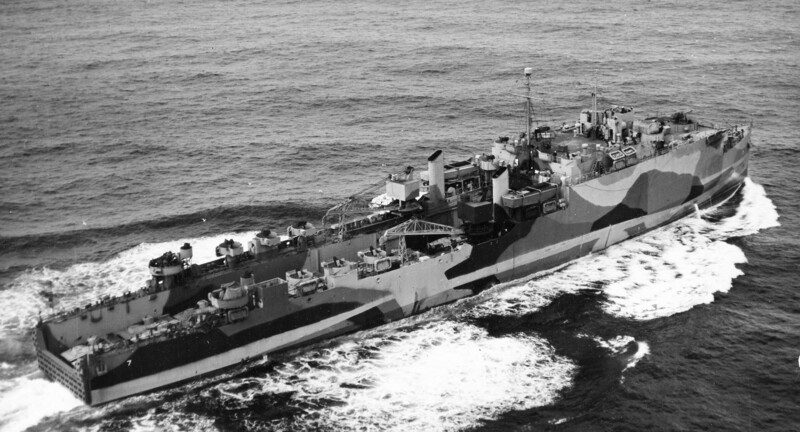 The dock landing ship USS Oak Hill (LSD-7) in an aerial view from starboard at sea on February 27, 1944 wearing camouflage 31/9L. The vertical colors should be dull black, navy green, ocean green, haze gray and light gray. Oak Hill was commissioned on January 5, 1944, and this photo was taken by squadron ZP-32. USS Oak Hill (LSD-7) in another aerial view from port again at sea, but on March 21, 1944 wearing camouflage 31/9L. This photo was also taken by squadron ZP-32. Another aerial photo of USS Oak Hill (LSD-7) probably the same day March 21, 1944 wearing camouflage 31/9L. This photo has an unspecified source. Photo source: NARA BuAer 230148. USS Oak Hill (LSD-7) this time in Ulithi Atoll on May 18, 1945 still wearing camouflage 31/9L.